Bearing either male or female flowers on separate plants, pampas grass (Saccharum ravennae) is grown primarily from divisions to ensure the new plants are the more desired female plants that produce the showier female flowers. Reliably hardy through U.S. Department of Agriculture Hardiness Zone 8 in southern Ontario, pampas grass is marginally hardy with winter protection in USDA zones 6 and 7, also in southern Ontario. Choose a location in full sun with well-drained soil. Ensure that there is adequate room for your pampas grass when it reaches it mature size of 10 feet high and 6 feet wide. For the greatest impact, it is best planted in the back of the flower border in groups of three or five. Plant starter plants of pampas grass in groups of three or five plants spaced about 3 to 4 feet apart within each group. Dig holes approximately the same size as the root ball of the transplants and insert the root balls into the holes. It is not necessary to improve the soil with traditional soil amendments or to fertilize when planting, as pampas grass prefers unimproved soil. Water in the transplants with a hand watering can, giving each individual plant about 2 qts. of water. Thereafter, provide with the equivalent of an inch of rainfall per week until the plants are established. Pampas grass will grow without supplemental irrigation in areas with adequate rainfall, similar to southern Ontario, after it is established. Prune with pruning clippers yearly in late winter or early spring. Remove the previous season's growth back to ground level. Wear long sleeves and pants to protect your skin from the sharp blades of pampas grass. Fertilize yearly shortly after pruning. Use a light, balanced, granulated fertilizer, such as 8-8-8 or 10-10-10, following the rate of application recommended by the fertilizer manufacturer. Broadcast the fertilizer granules around the base of the plant, taking care not to let the granules actually touch the pampas grass plant. Harvest flowers in late summer when they have fully opened, but before they mature completely and begin to shed. 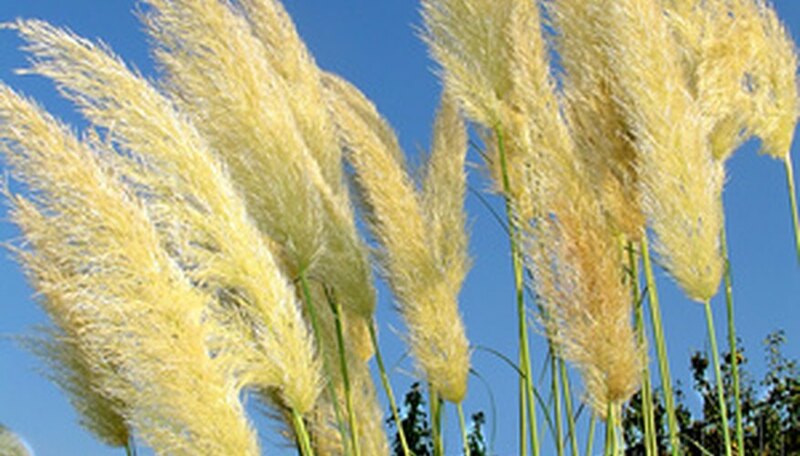 Spray pampas grass flowers with hairspray when harvesting to prevent them from shedding their feather-like plumes. Although not considered invasive in Ontario, pampas grass is considered an invasive species in other locations. Check with your local county agricultural extension agent to determine its suitability for planting in your area.